The Sphynx is a rare breed of cat known for its lack of a coat. The contemporary breed of Sphynx (known also as the Canadian Sphynx, distinct from the Russian Sphynx breeds—Peterbald, Don Sphynx) started in 1966, in Roncesvalles, Toronto when a hairless kitten named Prune was born. The kitten was mated with its mother (backcrossing), which produced one more naked kitten. Together with a few naked kittens found later it founded the first attempt to create a hairless breed. The first sphynx breeders faced a number of problems: The genetic pool was very limited; breeders had rather vague ideas about sphynx genetics, and many kittens died. There was also a problem with many of the females suffering convulsions. The last 2 descendants of Prune, a brother-sister pair, were sent to Holland in the 1970s, but the male was uninterested in mating and the female conceived only once, but lost the litter. With looks like this you would probably want to keep this moody moggy hidden indoors. 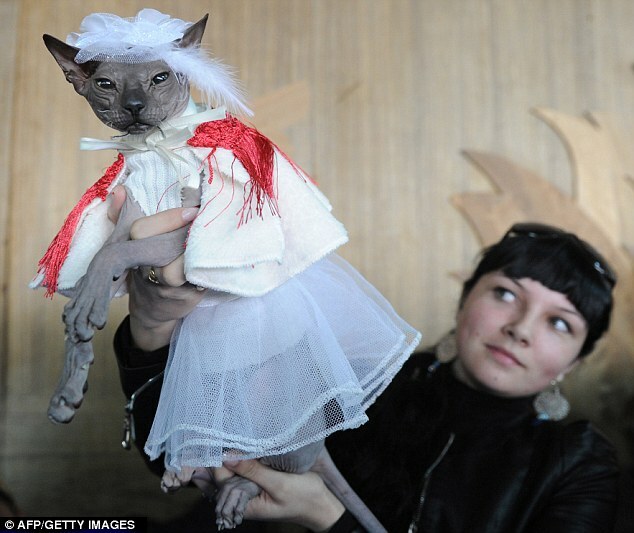 But remarkably this Don Sphynx cat – who looks not dissimilar to ET and a Gremlin – has been drawing hundreds of admirers at a cat show. The scary looking feline – who judging from this photo was having a really bad day – was showcased in Bishkek in Kyrgyzstan this weekend. About 100 animals from Kazakhstan and Kyrgyzstan took part in the event, giving owners the chance to show off their weird and wonderful pets. This cross kitty turned heads with his teeth shaped like four fangs and a blood red tongue. With black wrinkly skin he also showed off his piercing green and black eyes and ears pricked and alert like horns. Despite his unfortunate looks a delighted blonde behind him is clearly relishing his five minutes in the spotlight. Surprisingly they are described as affectionate, playful and sociable as well as highly intelligent. 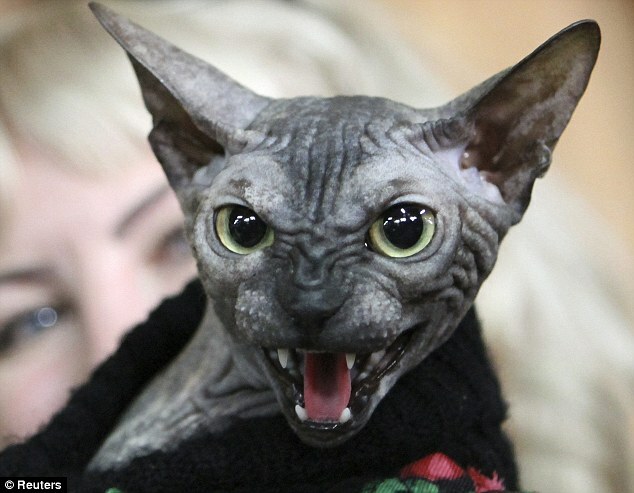 The Don Sphynx is hairless and is of Russian origin. The breed first emerged in 1987 in the city of Rostov-on-Don in Russia. Elena Kovaleva, a professor of the State Pedagogical Institute, discovered some young boys playing football with a bag. Inside the bag was a terrified kitten who she took home and adopted but the cat grew up losing her hair and went on to give birth to hairless kittens.